Bath time for your baby, toddler, or young child can be a fun play time and not a struggle. Some kids probably don't like taking a bath but parents can do something to entice them to have a trouble-free bath time. 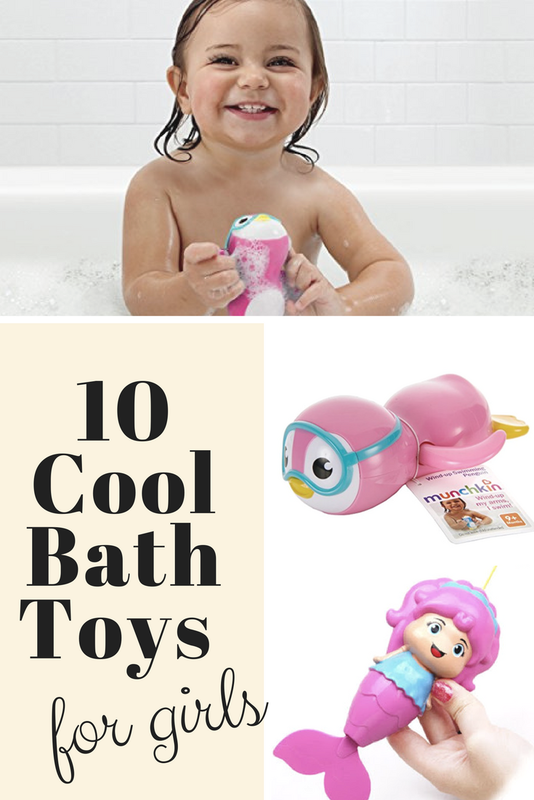 The best thing a mom or dad can do is to look for some bath-friendly toys that the kids can enjoy playing with. I remember my children enjoy taking a bath when they were still young (2 to 7 years old). We have a bath tub that they like to fill up with water and have a bubble bath. They also have some toys that they play with in the bath tub. They actually love their bath time so much that sometimes it's hard to let them finish and get out of the bathroom. Below are some of the favorite children's bath toys you can find. But, if you have some toys at home that's safe for kids to play with in the bath tub, there's no reason why they can't play with them while taking a bath. Check out the list below to get some ideas on what bath toy can be a good one for your kids to play with. 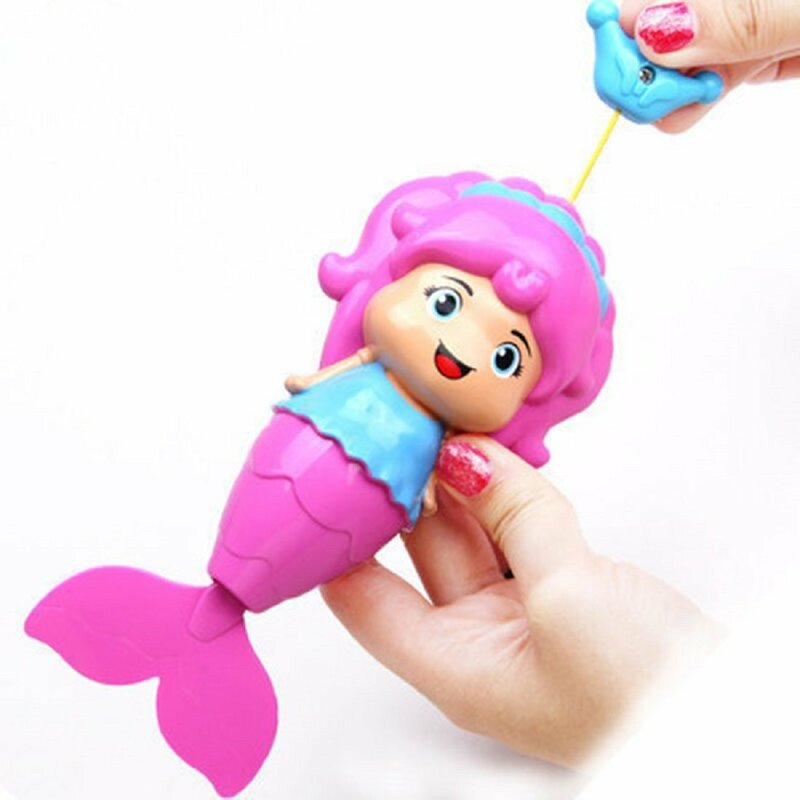 This cute Conquer Baby mermaid baby bath toy will make your baby smile during bath time! Just pull the line on top of the mermaid and the mermaid's tail will flap causing the toy to swim and float on the water. It's perfect to play with during bubble baths to keep your child entertained. It also helps your little girl develop her finger flexibility and eye-hand coordination. Who says your toddlers can't learn while it is bath time? They can learn their ABCs and 123s with this Munchkin Letter and Bath Toys set. You get 26 letters and 10 single digit numbers made of soft, durable, non-toxic foam. They float, or stick to the wall tiles when wet. They can be a pleasant decoration for the bathroom and a fun, educational bath toy for kids 3 years old and above. Squirting bath toys are a source of endless giggles. For sure your baby or toddler will love this First Years Disney Baby Bath Squirt toys.They float and bob, and squirt water when squeezed. They can also hold air and may be used to make bubbles under the water. 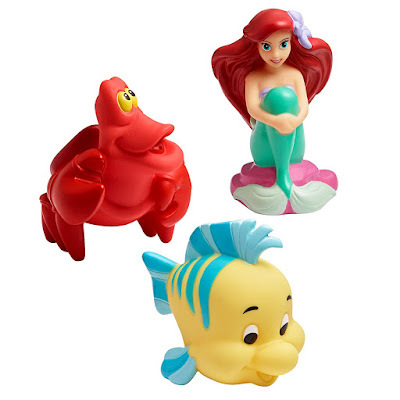 Let your little girl have the Little Mermaid Set squirting bath toys set to enjoy playing with Ariel, Flounder and Sebastian squirt toys. 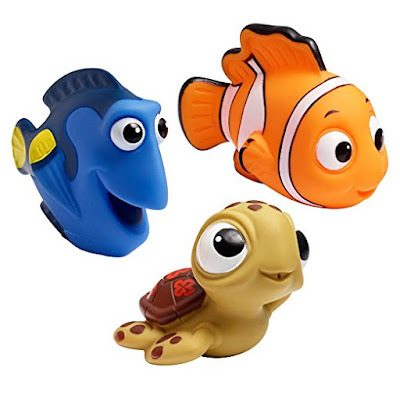 Get the Finding Nemo squirting bath toys set and let her play with Nemo, Dory and Turtle squirt toys. These squirt toys are perfect for 6-18 month old girls. Floating bubbles are just as fun as squirting toys for babies and young children. 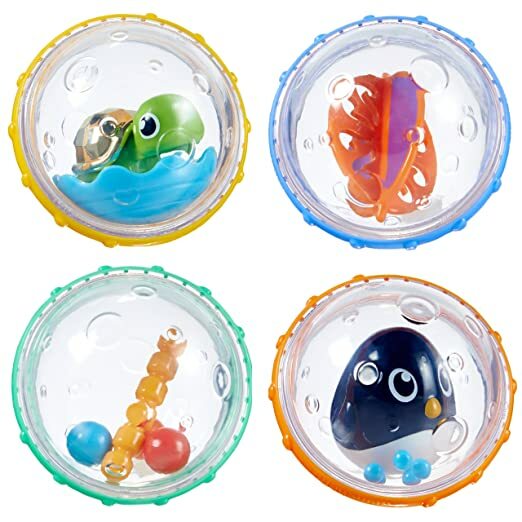 These Munchin float and play bubbles have little moving items inside them. As the bubble floats, the item rocks around inside the bubble. The colors are brilliant and beautiful. The rings around the edges move round. This recommended bath toy for babies 4 months plus will help stimulate her sense of sight, touch and hearing. 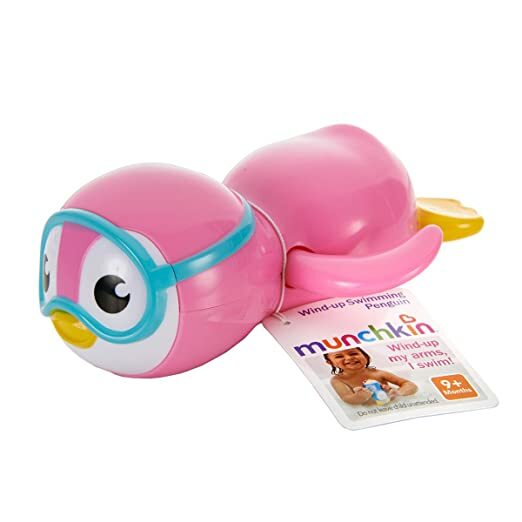 This cute Munchkin Wind Up Swimming penguin is perfect for a little girl. When you wind the penguin up, she floats on the water and flaps her flippers, swimming along. She is best suited to toddlers, not babies. This is suitable for children 2 years old and up who want their minds and hands busy during baths. 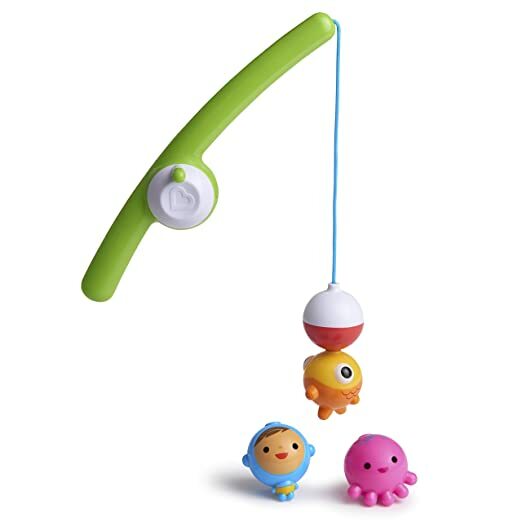 This Munchkin fishin' bath toy includes a magnetic fishing rod and 3 characters that bob just under the surface of the water. Using the rod to fish for the characters can help your child enhance her hand-eye coordination in a fun way. If you have a little inventor, they don't need to stick to Legos, puzzle toys and other living room building toys. 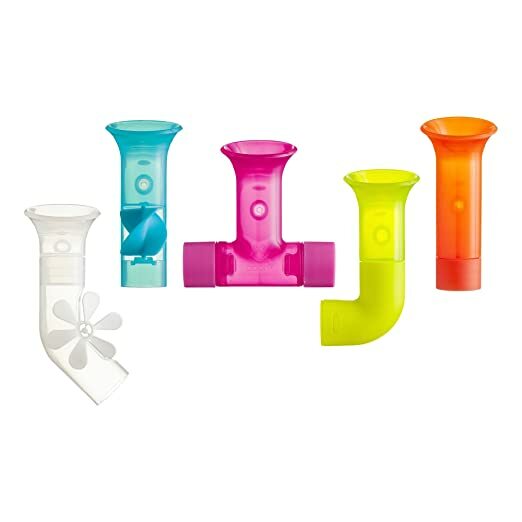 This set of Boon building bath pipes toy set lets your toddler or child make their own water puzzle. She can place the pipes to the wall tiles and create a chain so water can flow down through them. The set includes 5 pipes with different shapes and functions. Coolers are clear, and the paddles move, making the experience more exciting. This bath pipes toy set is recommended for children at least 12 months old. With this Playboom waterfall water station bath toy, your little one can have fun exploring the mechanism of pouring water using the stackable cups that come with the water station. 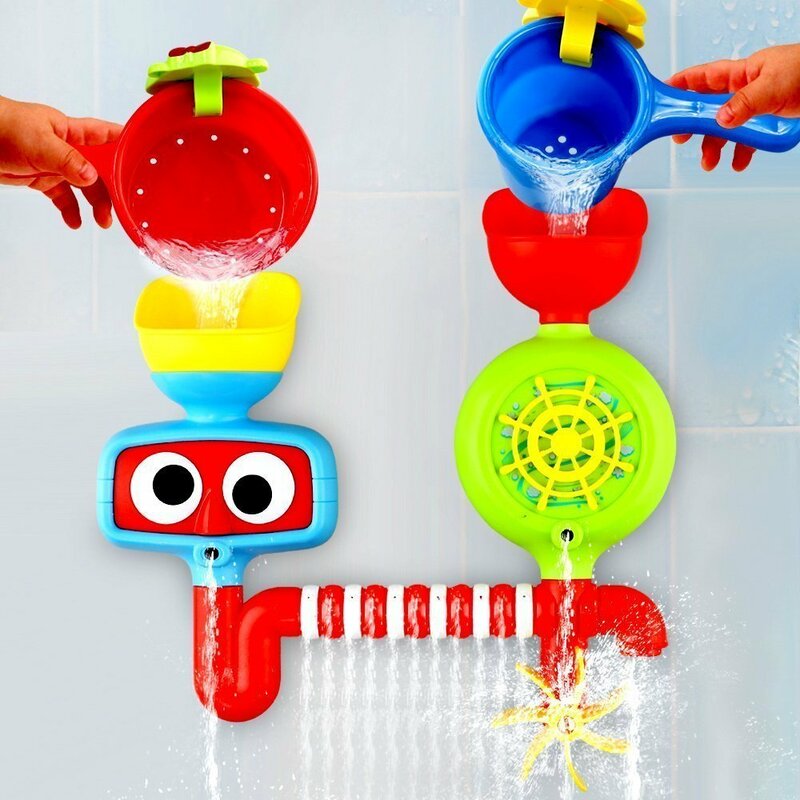 Your baby will be amazed with what happens to the water as it is poured through the two chambers - eyes roll, turbine and fan spins and water flows out of the pipe and roulette. Your child's bath time won't be the same again. She'll learn cause and effect, good hand-eye coordination and shape recognition, too. It's a great toy for children of different ages starting from 2 years old. Does you little girl like to play with Barbie? You can let her play with Barbie and her aquatic friends as she enjoys her bath. Barbie's brightly colored tops changes color as it touches warm water. Her pink dolphin friend makes dolphin sounds if she pushes its tail. Her puppy squirts water while enjoying the waves on its surfboard. Your daughter can use her imagination to recreate scenes and tell fun bath time stories. This Barbie Dolphin Magic Snorkel Fun Friends Playset is perfect for girls 3 to 7 years old. Another take on the swimming toys that have been around for ages. 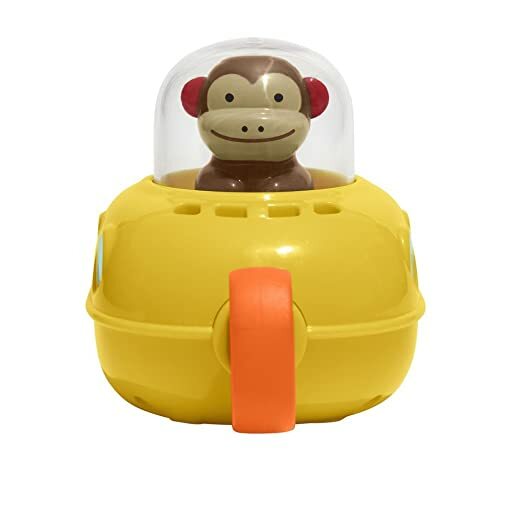 This Skip Hop Zoo Bath Pull and Go Submarine is suitable from 12 months up, as it has moving parts. When you pull the string, the propeller starts turning, making the submarine fly forward. It is fiddly enough to encourage motor skills, but not so much as to be difficult for your toddler. Just a little advice on how to clean bath toys so that they will last long. Wash the toys thoroughly before initial use and periodically since little children will be playing with them. Hand wash the toys in warm, soapy water then rinse with clear water. You can also use a vinegar-water-soap solution for washing. Just follow what is recommended in the video below. Air dry and keep them dry to avoid mold growth.